Lehi likely named his son, Joseph, after his ancestral father, Joseph, to remind little Joseph of his blessings and heritage. Nephi’s quoting so much of this particular prophecy of Joseph of Egypt proved to be a great blessing to us in the latter days. It is well for the student of the scriptures to turn to the back of their LDS version of the Bible (page 799 in the index) and compare JST Genesis 50: 24-38 with 2 Nephi 3. It is powerful to have another witness of the writings of Joseph in our canonized text. The Prophet Joseph was also blessed to find some of the writings of Joseph of Egypt in the mummies that were purchased in 1835 in Kirtland, Ohio. The translation of the record of Abraham later became part of our canon in the Pearl of Great Price, named The Book of Abraham (Translated from the Papyrus, by Joseph Smith). The writings of Joseph of Egypt, found in the mummies, have been lost to us. Some fragments of the papyrus were recovered in 1967 and given the Church, but the only writings of Joseph we have are that which is contained in the Book of Mormon, the JST and some few references to Joseph in the Bible itself. Surely the majority of this great prophet’s writings are yet to come forth. This prophet and seer of the latter days had to have the same name as Joseph of Egypt–Joseph–and it had to be the same name as his father–Joseph. How did this come about in the family of the Smiths? Was Joseph the oldest son, as is tradition to be the father’s namesake, in the family of Joseph and Lucy Mack Smith? No, he was not. How, then, was he named Joseph? One thought might be helpful in this brief observation. Joseph Smith and Lucy Mack were married in Tunbridge, Vermont on January 24, 1796. It has often been thought that Alvin Smith was the oldest son of Joseph and Lucy (born February 11, 1798), but recent research has unveiled a firstborn son who was taken before Alvin. In Joseph Smith Sr.’s patriarchal blessing book of 1834, he addressed the Smith family and speaks of “three seats” vacated by death among his children: “The Lord in his just providence has taken from me at an untimely birth a son…My next son, Alvin…was taken.” Ephraim was the other child who had passed away by 1834 (he only lived ten days). Joseph and Lucy’s firstborn son was taken in death sometime between the middle of 1796 and the spring of 1797. (3) Is it possible that Joseph and Lucy were planning on naming their firstborn son, Joseph, after the name of his father? When this first son suffered an untimely (likely premature) birth, did this shake the confidence of this young couple? Did they want to make sure they had a healthy child who would live before bestowing the honor of the father’s namesake? Alvin was born February 11, 1798. Hyrum came next on February 9, 1800, and then Sophronia May 17, 1803. Joseph, the Prophet, would come 31 months later on December 23, 1805. Did they feel inspired to call this child Joseph? If so, it is not recorded in any known record. Were they ready now to trust that this son would live? Did Lucy say to her husband Joseph, “Let’s name this one after you, dear”? However it came about, in the grand scheme of things, this winter baby of 1805, by prophecy, would be called Joseph, and he would be the mighty seer of the loins of Joseph of Egypt. Not many days after the death of the great prophet Lehi, “Laman and Lemuel and the sons of Ishmael were angry with [Nephi] because of the admonitions of the Lord.” (2 Nephi 4:13) Nephi, as the youngest of the four older brothers, was constantly constrained by the Spirit and by the Lord to call his older brothers to repentance. Now that Lehi (and likely Sariah) was gone, the brothers conspired to kill Nephi. 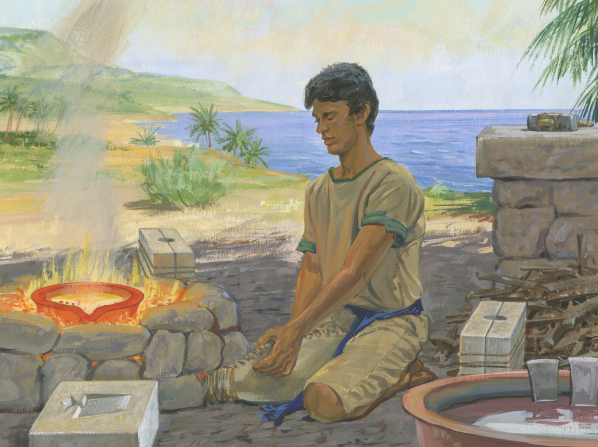 Having been left with the stewardship and charge for the family of Lehi, Nephi recorded his feelings as his family was crumbling and he had to make a decision about what he was now going to do. This section, 2 Nephi chapter 4, from verses 15 to 35, is commonly referred to as “The Psalm of Nephi.” In this inspiring and powerful series of verses Nephi resounds with his feelings of happiness and explores the depths of misery that come from sin. Through all of the trials and tribulations Nephi had been through, he had come to know the Lord. “And having seen many afflictions in the course of my days, nevertheless, having been highly favored of the Lord in all my days; yea, having had a great knowledge of the goodness and the mysteries of God…” Nephi truly does know the Lord. He has seen him (2 Nephi 11:2,3). He has been taught by angels many times. He has been supported and strengthened by the Lord through the terrible ordeal of the wilderness crossing and the ocean voyage to the promised land. Remember the Lord had told Lehi’s family: “And I will also be your light in the wilderness; and I will prepare the way before you, if it so be that ye shall keep my commandments; wherefore, inasmuch as ye shall keep my commandments ye shall be led towards the promised land; and ye shall know that it is by me that ye are led.” (1 Nephi 17:13, emphasis added) Nephi truly knew that the Lord had been their guide and their stay. When Nephi says “I know in whom I have trusted,” he truly means that he does know Him, even the great Jehovah, the Lord Jesus Christ. One of the great passages for the serious student of the scriptures to memorize is these twenty-one verses comprising this “psalm of Nephi.” These verses, whether memorized or read often, will always lift and strengthen the reader and give life to the soul. In a dramatic move on the part of Nephi, and following the admonitions of the Lord given to him (the same as had been given to his father, Lehi, to leave Jerusalem), Nephi takes those who will follow him and they separate from Laman and Lemuel and the sons of Ishmael and depart into the wilderness. Nephi takes many things with them that will for five hundred more years be an enormous point of contention between the two nations. He takes the Plates of Brass so that the people of the Lord would have the word of the Lord and the written language with them. He takes the Liahona, or compass, or director, which had led them through the deserts of the Arabian Peninsula. It is likely that the Liahona was used again on this journey to lead them to what would then be called the land and city of Nephi. He took the sword of Laban and from it replicated numerous swords so that the Nephites could defend themselves against the Lamanites and other marauders of this new world. And, of course, he took all those who would follow the teachings and commandments of the Lord. This small party consisted of Nephi and his wife and children (at least 4 people); Sam and his wife and children (at least 4); Zoram and his wife and children (at least 4 people); Jacob and Joseph (2); and also his sisters (at least 2–these are likely the wives of the sons of Ishmael-see “Lehi’s Family, sub-section of Lesson 6 in Meridian Magazine); and finally “all those who would go with me.” (2 Nephi 5: 6) Could this have been some of the children of Laman and Lemuel? Could this have included some of the children of Ishmael’s sons? Likely yes. The group leaving to go into the wilderness now is no less than 20 people, but likely somewhat larger. From this faithful group would come the nation of the Nephites. From those left behind would come the nation of the Lamanites. The followers of Nephi were following an ancient pattern. Whenever there is imminent destruction, and all else has been tried, the Lord removes the righteous from among the wicked and leads them through a wilderness experience, and finally they arrive in a promised land. The people of Nephi had done this before. The righteous would do it again. The Lord was with His people and helped them establish a new and prosperous land and circumstance. History of the Church, 2:236. SeeRevised and Enhanced History of Joseph Smith by his Mother. Edited by Scot and Maurine Proctor. Bookcraft, Salt Lake City, 1996, p. 46, fn. 2.